US, British and French forces launched air strikes on chemical weapons sites in Syria. Russia claims that most missiles fired were intercepted by Syrian air defence systems using Soviet-produced hardware. We all hope that this will not escalate, at present it being a targeted attack in response to Syria’s illegal use of chemical weapons. 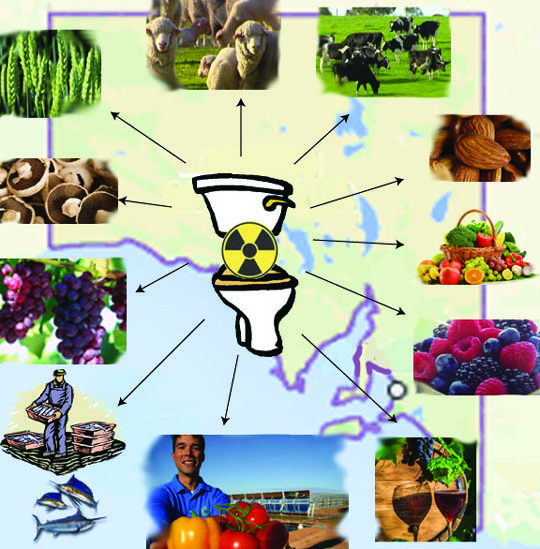 Australian govt plans for nuclear waste dump in rural South Australia. Kimba area local communities to have a Postal Ballot on this – BUT the National Radioactive Waste Management Facility Taskforce is NOT truthfully informing people. Janet Tiller has deep concerns over this plan to dump radioactive trash on agricultural land. Holly Whittenbury on Nuclear dump siting- Aboriginal issues, tourism impact. Justine Major: Radioactive waste dump should NOT be on agricultural land . Scott Cameron’s Submission to Senate finds process for selecting nuclear dump is misleading and faulty. Noel Wauchope Stresses importance of generalist, not just “expert” opinion being considered. Notes that, with no discussion, South Australia is already assumed to be the location for the dump. Nuclear Promotional Activities planned :Australia’s Department of Industry, Innovation and Science. Kimba Economic Working Group on nuclear waste dump set up by Dept of Industry Innovation and Science. Mayor of Kimba wavering about the area hosting a nuclear waste dump? Lucas Heights’ accumulation of dangerous nuclear wastes. Costly and top secret transport of nuclear waste from Lucas Heights to (possibly) Port Kembla, then to France. Bushfires today 15 Aug near Barden Ridge (i.e. Lucas Heights): could they be a threat to the nuclear reactor complex? South Australia’s Liberal Premier “open to nuclear power“. Whyalla steelworks boss Sanjeev Gupta says renewables ‘cheaper and easier’ than nuclear.a. Federal Science Minister Canavan this week announced a postal ballot August 20 of the so-called ‘local communities’ – Kimba & Wallerberdina – for the purpose of gaining consent towards furthering the NRWMF Site Selection process. Informed consent requires both these electorates (& the wider Australian society) be fully appraised of all facets integral to any nuke dump. 1. Adequate time to digest & follow up the outcomes from the current Senate Select Committee Inquiry into the NRWMF Community Engagement Process. 2. A complete knowledge of the actual nature, containment types, timings, duration & volumes of material destined for the facility – including a full & competent inventory of radioactive waste legacy holdings. For example: HIFAR decommissioned; ILW from all sources; CSIRO & DoD Woomera; DSTO Edinburgh; & SAGovt Radium Hill, amongst others. Without such widespread understanding, any Poll result would lack competency, demonstrate a failure of administrative process & further exacerbate the existing community divisions created by the NRWMF Project deficient governance. So far, the National Radioactive Waste Management Facility Taskforce has focused almost exclusively upon ANSTO radiopharma production gloves & gowns @ Lucas Heights. from the nation’s commercial reactors are on a tour this week to make sure people know what’s being proposed for southern New Mexico. The Nuclear Regulatory Commission is considering a proposal from Holtec International to build and transport the waste, now stored in casks at various nuclear power plants around the country, to southern New Mexico. years’ worth of nuclear waste generated on the East Coast. Senate Inquiry Submission into the Nuclear Waste Site Selection Process , Janet Tiller I am deeply concerned and upset that the Federal Government are considering Kimba as potential site for a Radioactive Waste Facility. Kimba has been a farming community since the land was starting to be cleared in the late 1800’s. We produce mainly Wheat, Meat and Wool and I am afraid if the Radioactive waste is stored anywhere in our community it could adversely affect the prices for our land and the Wheat, Meat and Wool (they can be very fickle industries). I would also like to know what is the true definition of broad community support. We were advised it was 65 percent then after the vote to determine those for and against the facility, Matt Canavan the Minister for Industry, Innovation and Science decided it would be 57 percent. Why? The vote was only for Kimba residents, farm owners and people that owned property in the community. The Dump could adversely affect more than just Kimba it could affect the whole of Eyre Peninsula with its “ Clean Green” image, a Radioactive Waste Facility won’t exactly fit in there. A committee of 16 has been formed and their aim is to decide where the $2 million (now we are in the 2nd stage of the process) will be spent in the community. The committee was selected from applicants and said to be chosen from a broad selection of the community from Farming, Business, some for the RWF and some against. There are only 4 people on that committee of 16 that were against the dump, they won’t have a very strong voice will they? I look forward to your reply. A top-secret security operation to send spent radioactive fuel rods from Australia’s nuclear reactor to France for reprocessing is planned for the coming months. Potentially involving hundreds of state and federal police, the details of the transport operation will remain confidential until after the shipment arrives at La Hague, in northwest France. The Australian Nuclear Science and Technology Organisation at Lucas Heights in Sydney’s south has confirmed the shipment will be trucked to a port for transport to La Hague midway through this year. The route, the port, the time and the ship, as well as the numbers of ­security personnel, will remain confidential until after the mission is completed. The last shipment of spent rods was sent to the US in 2009, and both Port Kembla and Port Botany have been used as shipment ports in the past. When reprocessed nuclear waste was returned to Australia in 2015 for storage at Lucas Heights, more than 500 police were ­deployed to guard the shipment, and it is expected at least that number will guard the radioactive cargo destined for France. The radioactive spent fuel rods will be packed into an undisclosed number of ­immensely tough lead and stainless steel transport casks for the journey to France. The total cost of the project is $45 million, including the contract with France, equipment, staff costs, and incidentals. Department of Industry, Innovation and Science Bruce Wilson, 9 April 2018. The department has compiled the attached table of planned activities with indicative dates. As explained in the department’s submission, provided on 3 April 2018, the process is beingundertaken closely with the communities. Accordingly, the milestones and precise dates of activities will depend on community feedback and will be determined with community representatives. The timing of certain decisions within government are also the prerogative of the Executive and could be subject to change. For this reason, we have included a highlevel timeline of activities, with broad date ranges, to allow flexibility to respond to the needs of communities and executive government processes. 12 APRIL 2018 A new group in the South Australian community of Kimba will be charged with investigating all economic opportunities and issues associated with a proposed National Radioactive Waste Management Facility. ………The Kimba Group mirrors successfully established group around the Wallerberdina Station site, which is already developing a range of ideas on how local business could benefit from a Facility.The Kimba Economic Working Group will meet on about a monthly basis for the duration of the Phase Two consultation process.